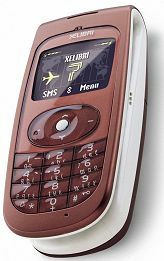 As Xelibri phones (mobis from Siemens with odd designs largely aimed at women and gay men) go, the 7 appears run-of-the-mill, until you turn it sideways. Seemingly inspired by David Beckham's habit of clipping his clamshell phone over the top of his pocket, the 7 doesn’t just have a clip, it IS a clip. So you can wear your phone with pride, without having to worry about it dropping down the toilet. It’s familiar fascia is a relief after the gimmicks and trickery of the other phones in the range, and again Siemens operating system makes the 7 very easy to navigate. However, on a downside the buttons have a slightly shiny, slippery feel, which is another less welcome feature found on many Siemens phone. You also have to prise open a small, hinged flap to connect the charger, and on the test model this had already come loose. Indeed the general build quality is less than average, and the phones feels somewhat plasticky, but this could be necessary due to the integral flexibility needed for the clip design to work.